​Bali Elephant Ride and Tanah Lot Tour is a Bali Combination Tour Packages by give you the Enjoyment ride an Elephant at Bakas village and continue visiting the famous Tanah Lot Temple. This opportunity offer you two different experiences during your holidays, Is chance Riding the biggest mamals in Bali islands and continue visiting Tanah Lot Temple and other tourist destination during the trip. Bali Elephant Ride and Tanah Lot Tour first visit is Bakas Village at Klungkung Regency by give you chance Riding an elephant through the bushes, jungle and passed the Balinese village for 30 minutes, after ride the elephant for 30 minutes you will enjoy lunch at Elephant park at Bakas village, Then the tours continue visiting Taman Ayun Temple in mengwi regency, this temple is one of famous temple and as Unesco world heritage list, we will go look around the beauty of the temple, Then visiting Alas Kedaton Temple is monkey forest in Tabanan, the temple located in middle of forest with hundred of group monkey dwell here, you will see the beauty of the temple and the funny monkey. Then visiting the last site during Bali Elephant Ride and Tanah Lot Tour is Tanah Lot Temple, this temple located in Tabanan village and the uniquess of Tanah Lot Temple is located right on the beach on small rock with Holy snake on the cave and Holy Water beneath the temple. Our professional Bali Tour Driver will offer you the excellent services during the trip. Below is explaination of the tourist destination will be visit during Bali Elephant Ride and Tanah Lot Tour. 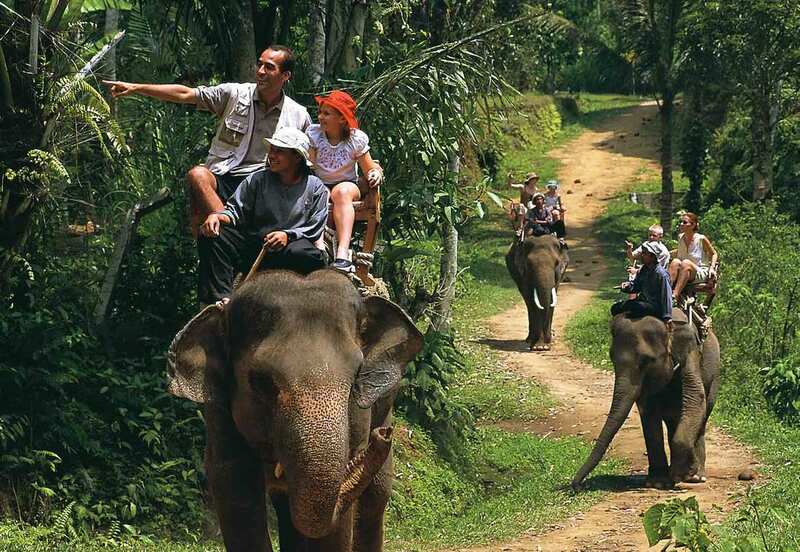 Bali Elephant Ride Tour give you opportunity to ride an elephant by take program Short Ride (30 Minutes Elephant Ride) at Bakas Village at Klungkung Regency. You will go along green bushes and side of river. During the Elephant Trip you will also see beautiful green hill and sometimes appearance of monkey's. the ride that last only 30 minutes of Bali Elephant Ride Tour program. This rare experience you will have during your holiday in Bali islands by Riding the biggest animals and see the amazing view from the top of the elpehant. No doubt this great chance to feel ride on teak chair in the biggest mamals and guide by professional elephant handlers. Taman Ayun Temple located in Mengwi District and about 55 minutes from Tanah Lot Temple. This temple is designed with Bali architecture with beautiful designed and amazing park, this temple has three section firs section you will see a beautiful park, second section you will see Balinese wooden bell or known as a Bale Kul Kul and three section is the main temple, we only can see the main temple from outside. Taman Ayun Temple is built on the flat land with big fish pond surround it and it is looked like adrift on the water.